Size is n't everything. Just nine tenths of the law. 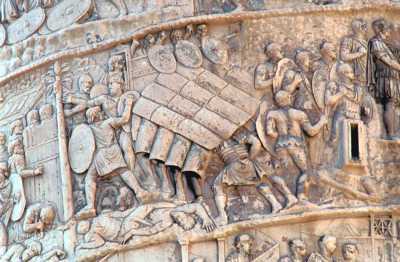 The challenge presented to the sculptor of Trajan's Dacian Campaigns Frieze was immense. 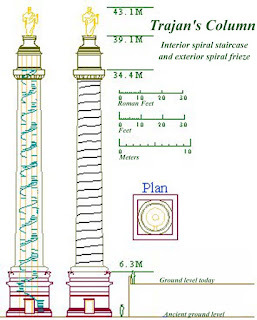 He had to describe the Emperor's two campaigns, with as much detail as possible on a spiral 'scroll' 190 metres long and between 1 metre high at the base and 1.2 metres high at the top. We will not discuss the immense engineering task involved. We are interested in the problems of depicting landscapes, buildings, transport, men and animals in a series of vignettes which flow into one and other and still make visual sense and satisfy a constrained but lively visual æsthetic. The first decision was about the level of detail. The sculptor decided to represent the soldier figures at a size where he could render very small details of equipment such as armour construction and hair styles. It could be that this was a prerequisite of the design because many of the faces would be modelled after actual participants. It was certain that the Emperor would be depicted and he should definitely be modelled from life and recogniseable. 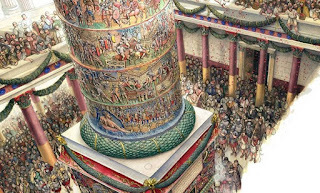 He crops up 59 times on the monument and so it was abviously an important ´factor that the passing dignitaries and onlookers' kids, could easily pick out Trajan in his cartoon-strip superhero world. This condition meant that the smallest characters would be about half the height of the frieze. Sculpting in stone which is to be plastered and painted cannot go below a level of detail where either the stone edges will easily weather and crumble or the paint and plaster will fill it in. The Emperors face must be large enough to recognise but not so large the other figures appear out of kilter as he performs his feats. A man sixty centimetres high could still be discerned up to the column's 35m top. Ok why the long paragraph ? Because the men dictate how much space there is left in the frieze for stuff. A weapon a man is holding or horse he is riding stays near to scale, but to save room and to make scenes more meaningful - for example, showing the foot of several fortress walls rather than the whole fortresses - buildings and nature and transport are shrunken down to various proportions. In this way forts, ships and cities can be meaningfully and impactfully presented along side the men who can readily be seen to toil, fight, march, suffer and die before the onlooker. Remember this is the culture that brought you gladitatorial games. The culture that thought watching helpless people being eaten alive was right-on. The culture that, should anyone have suggested the establishment of safe spaces or issuing of trigger warnings at the Colosseum, would probably have dumped the suggesters straight over the parapet onto the sand. Trajan's architect, possibly Apollodorus of Damascus, had the genius to proffer a bloody and moving spectacle to the citizens of Rome that continued long after the last Dacian captives had expired in the arena. An everyday set of executions in gory colour. A banal and baleful spiral of violence that one could sit and contemplate while eating lunch five days a week. Any Roman confessing himself tired of Trajan's victorious tragedy would indeed be a Roman who was tired of life, and death. 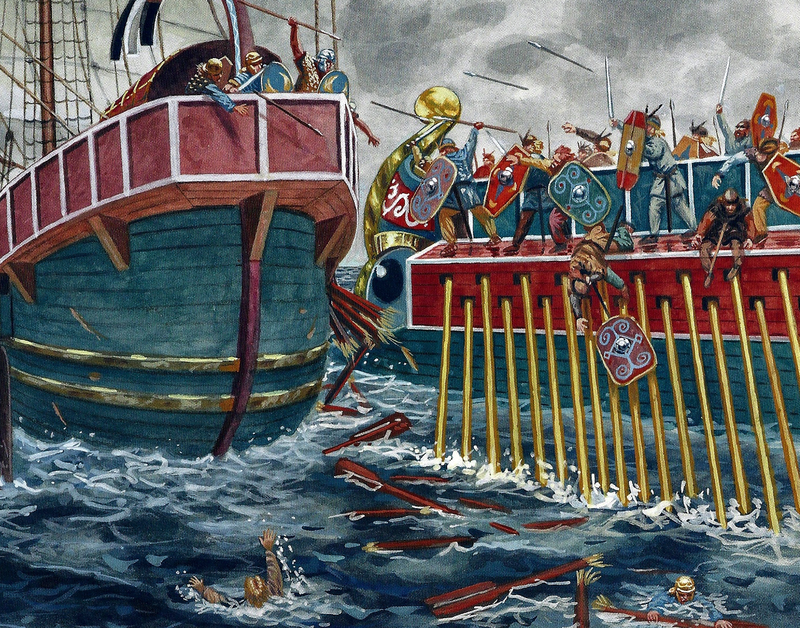 But triremes. 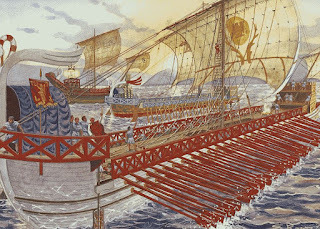 What about the bloody triremes ! ? Coming to that. I promise. 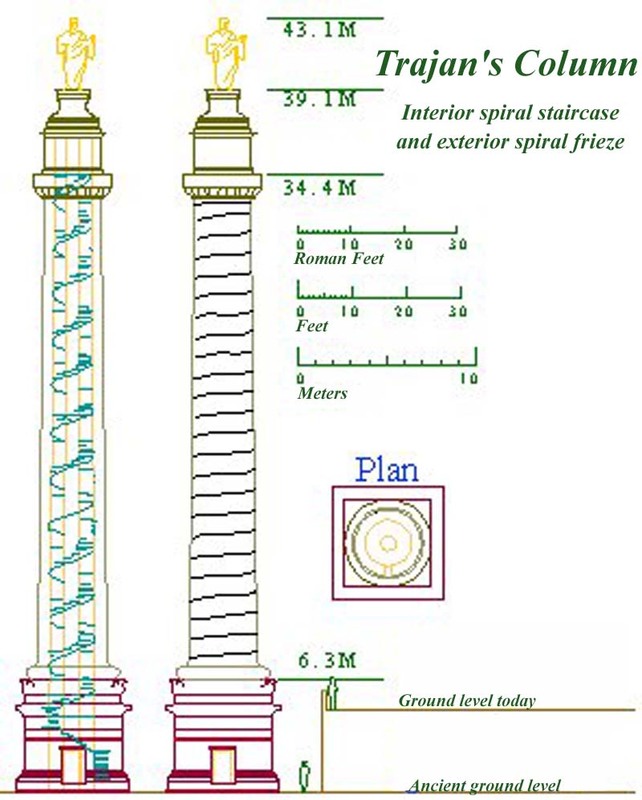 The problem of proportions when one looks at anything on Trajan's Column must be considered. When one looks at fortification or engines, for example. Especially when one looks at the ships. The size of things must be worked-out. Relative to each other and relative to the men in and around them. Actually, on the Column the trireme is only ever shown at sea and not a long way up the Danube. The nearest ship is a Three, in Roman parlance a trireme. 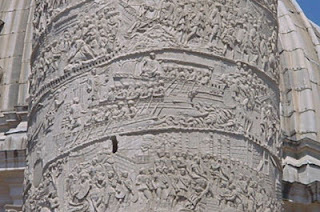 Oarboxes seem to have been dispensed with by Trajan's time and the vessel depicted on the column has two tiers of oars worked through ports and one over the gunwhale. This kind of hull would have been more stable than when the oar-tiers were canted out over each other. All fine and dandy. Apart from the fact the artist has screwed the upper oars in place under the lattice screen - how could they be moved ? Scale immediately rears its ugly head. 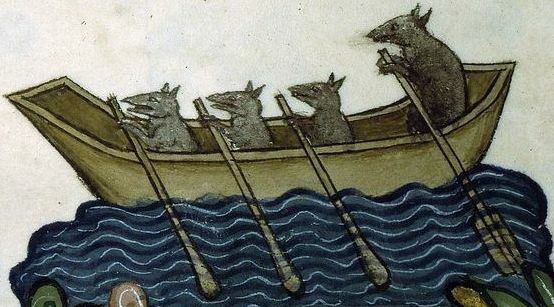 The rowers in the ship are like little mice behind bars with their little paws struggling to use the telegraph-pole oars. Nuff said. Trajan(?) - presumably, and some sailors look up in wonder at a lamp hanging from the aphlaston which is metres above them. The arched shelter is vast. Why should it be so vast ? It will catch wind. It will block sight. Is it so the Emperor can ride into it on horseback ? It takes up too much room. 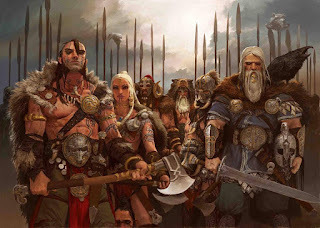 Or maybe the men are dwarves. The aphlaston itself, instead of being a delicate, graceful display of the carpenter's art is a monstrous thing made of giant timber. The rowers are sitting surrounded by an expanse of deck. The only problem is that the deck should be over their heads. The deck should be sitting on the top of the megalithic lattice-work that screws the top oar tier to the topwhale. On the column, our sculptor chappie has omitted the deck so he can show a few oarsmen in the vessel. The trireme is Trajan's flagship and so he should have some company, working hard to propel him along. But he cant have all the rowers hidden in the ship. So he gets a few that are liberated from inside the ship and proportionately larger than the ship but matching Trajan. The rigging is up again. And all the oars are out. Read the 'Olympias' books to learn this is a rare occurrence, especially when the sail is so full that the ship will move faster than the oars and give the rowers an interesting experience. 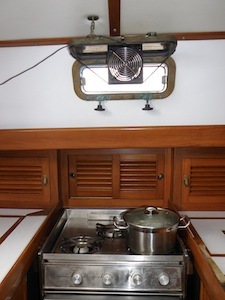 The rig is not badly done but a galley of this size would not have a rope ladder for the tiny crew to climb and the reefing lines should be secured at the gunwhales so they do not form a barrier across the deck. Now we get to the front of ship and something odd awaits. Dodging the health and safety problems of a barbeque on deck we see an enormous castle is erected in the bow. Plainly, the castelated prow of the ship on the column coul dbe scaled up a bit, but this much ?. The forecastle is too high. Even assuming the men are 1,65m tall it is three men high. 5,7m is a lot to stack on a ship's bows. No wonder it's going fast with full sail and the wind catching in this structure! But there is no wake so I need not be worried, Looking at the column the ship's forecastle could easily be interpreted as being as high as a man's waist only. Something funny happens at the bows where the ship is flaring out but this is hard to discern. The liburnian sailing along on the port side suffers the same problems but has few visible crew. Its upper oar tier is worked through the screen rather than under it but this is merely an adjustment of the basic error. The screen was a deck support - the oars worked over the gunwhale. The steering oars are truly massive. Both ships have very high freeboard and massive sterns. The freighter in the background is a classic corbita. 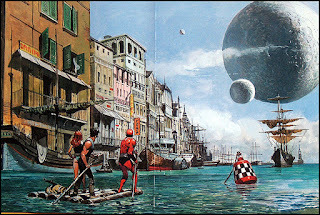 It turns out the giant radio valve is a lantern hanging from the trireme's aphlaston so that problem is solved..whew. No more detail can be seen than in any sculpture. That's it. The ships are disproportionate and have misinterpreted structures. In plate C the Pannonian Fleet is attacked while iced-in by Iazyges. Two ships lie in the foregound so that their curved bows and prow ornaments form a picturesque circle around struggling Romans and barbarians who have now become Jazigi(sic) and Quadi. Oar is 4.95 plus length under water and inboard. The left is supposed to be a celox or keles from the Alba Fucens relief. There is no evidence for celoxes after the first century BC according to Casson. 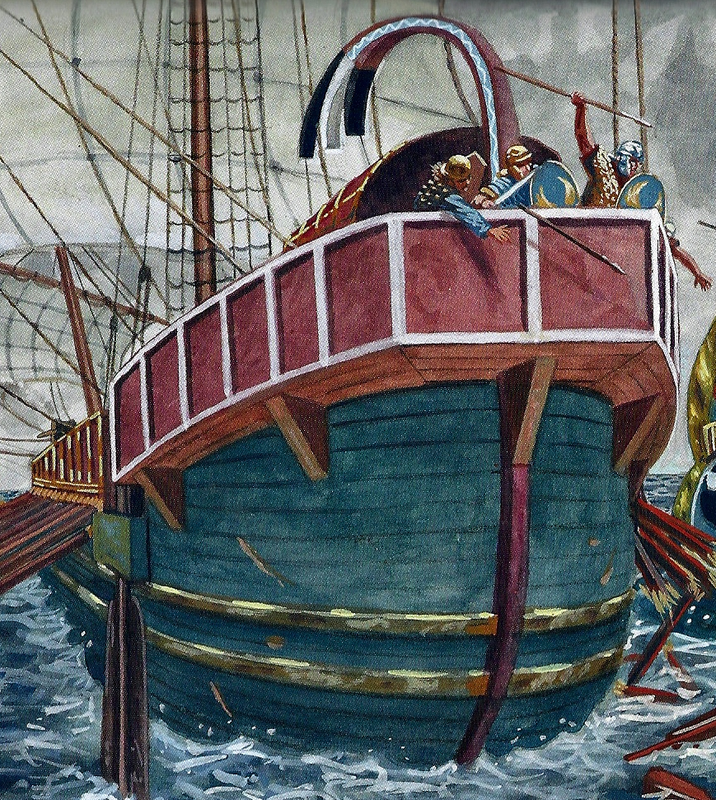 A celox was a light, fast merchant galley with few oars. This one is big. The gunwale is about 3.5 metres in the air. This means the ship is as high as a Seven, surely not. The oars necessary to row this 'ship' along would have to be about 6 metres long to be useably. Longer than those of a Three. A handy feature of this book is that it contains the evidence that proves itself wrong. 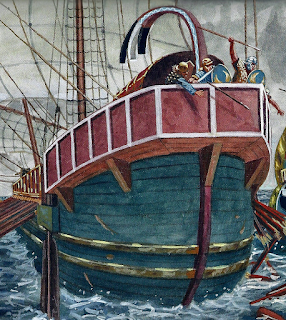 A celox was a ship with a straight bow. The Alba Fucens relief on page 40 shows this.The caption of C says this. 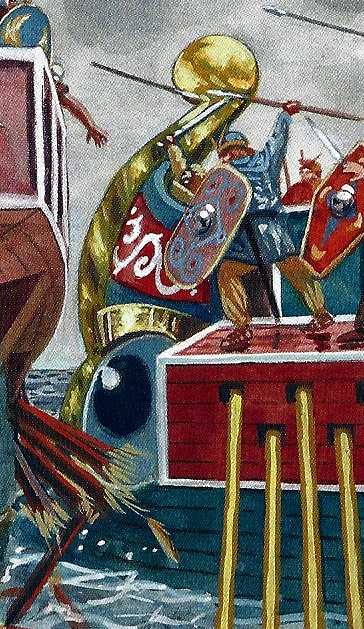 The ship in the painting does not have this - it has an outward-curving fore-foot with a bit of tin plate nailed to it. This 'ram' appears to be the forefoot reinforcement of the boat 'Alkedo'/Seagull found at Pisa illustrated on page 39. The boat on page 39 is not given a scale, why ? Because it is too titchy ? In fact, this boat is only 1.23 metres from keel to gunwale. It was 14 metres long and 3 metres wide. It was not really a ship. It was a fast riverboat. At 14 metres it could have been rowed by about ten men. It is not a warship. It would not be fitted with a ram. Wishful thinking. The right ship is not discussed but seems to be a liburnian from the column. It is, as usual. too big. Meanwhile, the Romans and Jazzy guys hack and slash in the background. 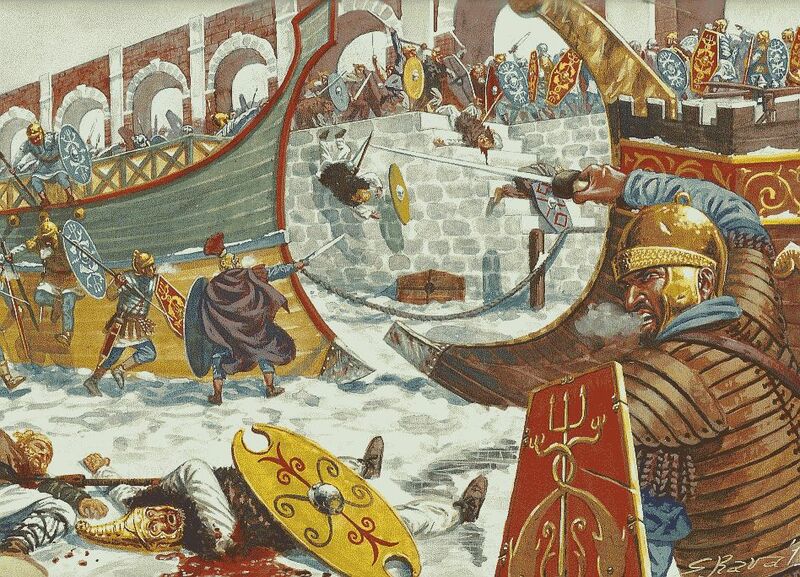 The dead warrior in the foreground is derived from Osprey Men at Arm 129 Germanics and Dacians. He is a mix of figures C1 and C2. Is this good enough ? An Osprey book which uses Osprey books as its reference sources ? The shield design is exactly the same for fucks's sake. I am no armour buff but didn't leather strap armour go out with early Hollywood ? 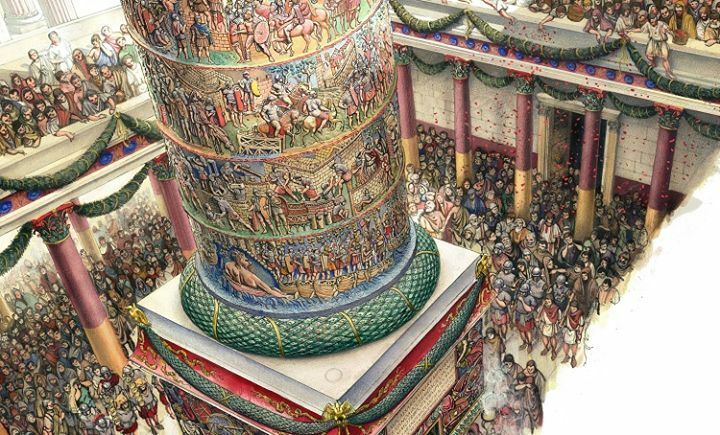 What the book has let slip is a chance to really examine and reconstruct the ships of Trajan's Column because this is the single biggest assemblage of detailed evidence. There are warships of different sizes and other military support ships. They could have been well reconstructed and illustrated. They are shown in photographs but not reconstructed here. The other chance lost was to use the excellent photos the author has of the Pompeii and other frescoes. They are nice to see in clear colourful photographs but quite a chance is lost to recreate them in colour. Coming soon - more crap. New Vanguard 230 is the second in a triad of Ospreys about ancient galleys. The third is due out in February 2017. Something to look forward to. I predict it will focus on dromoi,and riverine craft which could have been included in this volume and have Germans on rafts etc. Anyhow, gudeskelov!, we will be treated to another volume by Butch and Sundance. This book,NV230, in common with New Vanguard 225, is presented as a great new addition to a field which galley fans consider lacking in easily-accessible material. Like NV225 it falls down on closer examination. There are good things about this book. The standard of written English and editing has increased greatly. The photos, often by the author or his contacts, are often fresh and some novel. Living in Italy has some advantages apart from looking at girls on passegiata. It is worth getting this book just to have a new set of visual reference material. BUT, I write only of the photos. 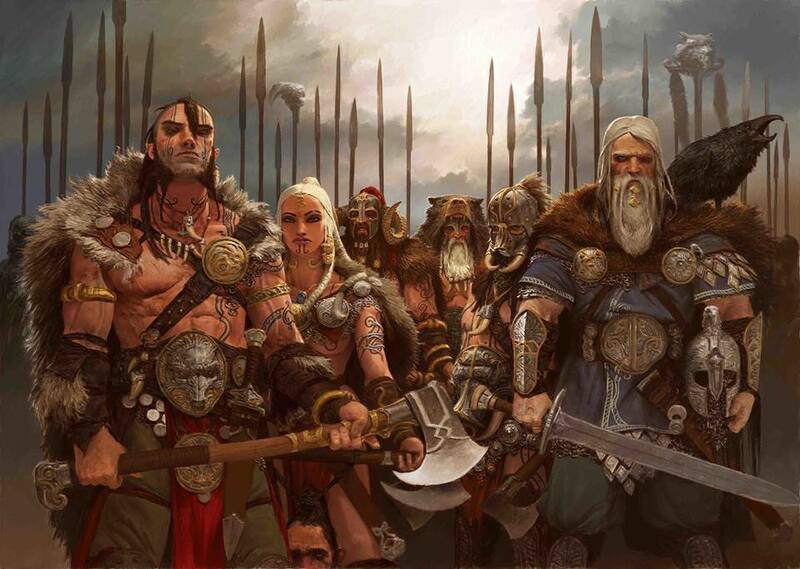 The reconstructions, the main selling point of Osprey's titles, fall down again. Discussing the text in depth is a fool's errand when it comes to a short book such as this that draws from the entire field of ancient history. There are arguable passages but life is short. I will try to hold to the 'in your face' assertions of the reconstructions. It can be argued that a reconstruction need not be rigidly constrained in such a publication. 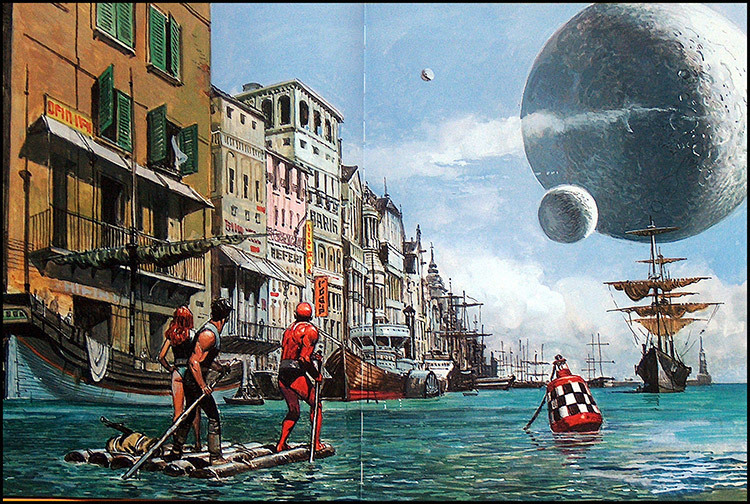 In former days illustrated magazines often included a degree of fantasy to enliven their reconstruction scenes. I do not deny this possibility. To some degree it is essential if a scene is to be made complete, lively and immediate rather than a staid 'illustration' like a Victorian parlour photograph. Books about Arthurian topics or 'Celtic' Heroes etc. have appeared over the years with more or less fantastical content but they fill a need felt somewhere. The frados came seeking a crate of bronsons but with no kale to their name. The topic covered here has been worked-on for lifetimes by technically expert linguists, classicists, archaeologists and marine architects. To avoid their conclusions must be folly. One cannot have one's panettone AND eat it. Surely, one cannot author a hasty, erroneous publication AND expect it to be taken as gospel, an unchallenged academic groundbreaker. But maybe one can. 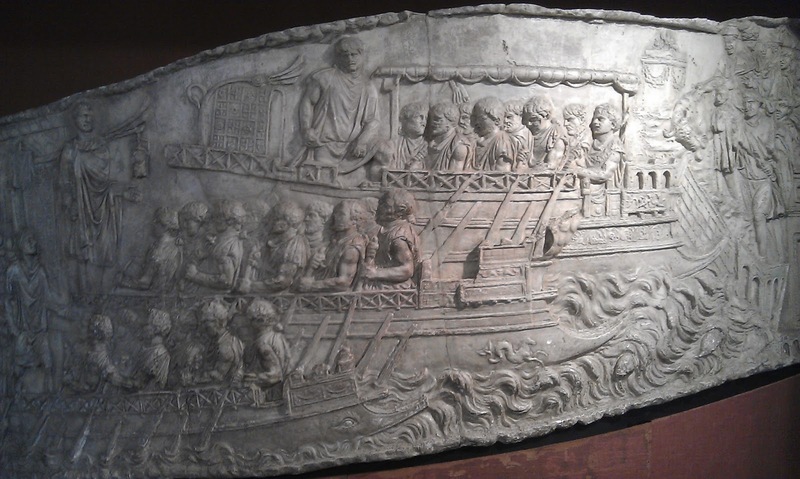 This plate is about Civilis' revolt in 69AD inspired by an event from Tacitus V.23, when the Imperial commander Quintus Petillius Cerialis faced an ad hoc fleet of rebels in a lagoonal area at the confluence of the Rhine and the Maas. 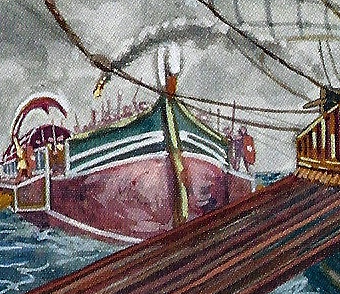 Cerialis' ships were larger than those of their opponents. 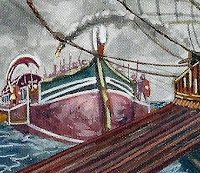 Civilis' fleet included biremes as their heaviest units and a mass of single-banked vessels and small boats of which any used cloaks as jury-rigged sails. The (un) interesting thing about this encounter is that the two forces sailed past each other once, exchanging a few light missiles as they did, before the rebels withdrew. There was no encounter whereby oars could be broken or whereby ships were ready to board each other . Two formations navigated past each other in opposite directions. 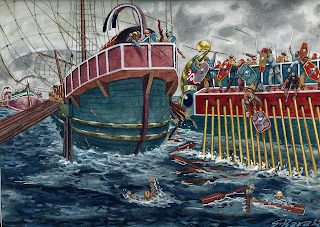 Tacitus says the Romans were aided in speed by a favourable wind and the rebels by the current of the Rhine. One should add that the 1931 Loeb translation which NV230 paraphrases declares that 'In the confused condition of the text at the beginning of this chapter, we cannot do more than give the probable sense of what Tacitus wrote'. A galley, Midship we will call it, has been inefficiently rammed by another, Rightship, in the stern starboard quarter. Midship is under full sail AND has oars out. This could mean a high speed, up to 11 knots if the oars are out of the water. If there was no benefit to be had from the wind then progress would be by oars alone. It has no discernible wake. There is no wake from the steering oar. Is the ship stationary under sail and oar ? One could make a case that it has just made an abrupt course change to port and thus whacked its starboard stern quarter onto Rightship's port forward quarter, smashing some oars. But why would it have done that ? No, it appears that Midship is under attack from Rightship. Rightship is under oar. Large ones of the species. Calculating from the foot of a rebel warrior, conveniently having a breather on the parados, These oars are about 20cm thick. 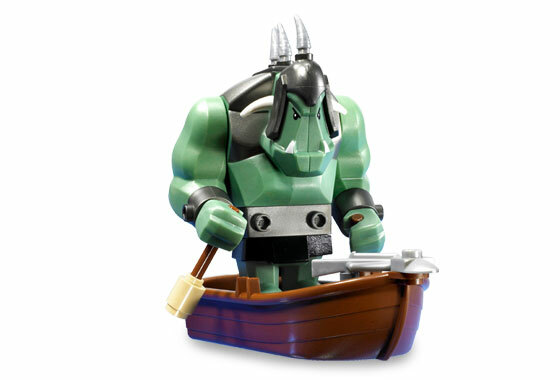 Luckily, we cannot see the Schwarzenegger-Orc mutants hidden inside the ship who are pulling these things. 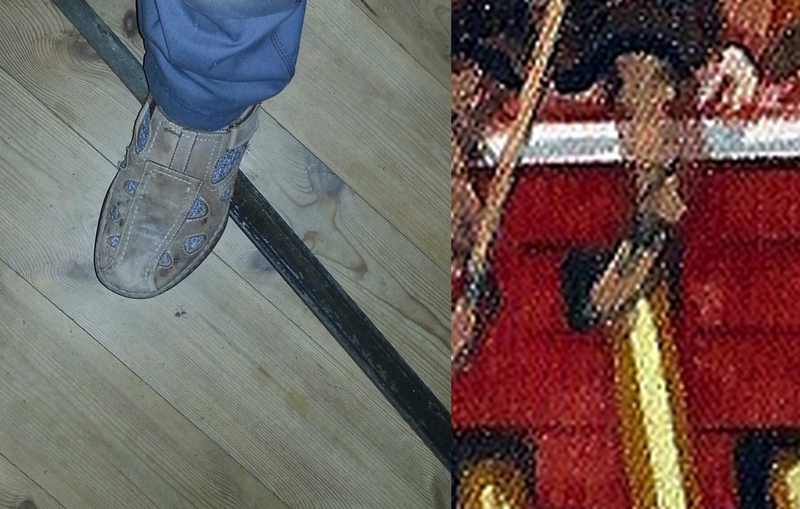 The oar under my foot can pull a 23m Viking galley along. With a few others working alongside, of course. Rightship is attacking a target which should be moving faster than it, both have two banks of oars, are 'liburnian' types, but Midship has full sail.If the oarsmen on Rightship make another stroke, however, the foremost oars will strike the stern of Midship. If Rightship had intended to make a hypothetical 'oar-sweep' onto Midship, surely its starboard banks will have retracted their oars to avoid damage ? So that option is out. The only option remaining is that Midship held course as a slower vessel loomed to port on a collision course and only when impact occured, steered away. Meanwhile Leftship, a galley under oars is managing to come up against the wind with sufficient speed that it intends to ram and board Midship head-on. Only in the movies. Let's look at Leftship. It's quite broad. If it is a liburnian then it should have a breadth in the order of 4 metres. If the chaps calmly standing to attention on the non-existent oarboxes of a charging ship are 1,8 metres tall then we can easily see that Leftship is drawn as being five times as broad. i.e. 9 metres or so. Should be quite stable, then. These men are doomed if any impact occurs, of course - 2G of force will throw them bodily into the sea or onto the deck of the target ! The ship appears to be directly based on one of the ships from the Temple of Isis at Pompeii, shown on page 11 even though the caption says it is based on the Aula Isiaca fresco - which is not shown in the book and only shows the stern of a ship. Confusion in the ranks somewhere. Broadly speaking, this is inaccurate. The whole bow structure of Leftship is odd. The stem-post has a Swan as an emblem, usually associated with the stern of Roman merchantmen. The ventilation course is absent, so the straining monstrous orc hybrids in the basement will soon collapse. There are no apotropaic eyes, which this artist generally renders quite generously. Maybe the ship had to be blind in order that it should be persuaded to ram bow-to-bow against a faster oncoming ship. Leftship is supposd to be copied from a fresco found in the cult room or Aula Isiaca under Domitian's Palace in Rome. The ship depicted there has THREE oar levels. Only the stern part survives. Rightship is closer to us and has more detail. It is copied from the Aula Isiaca as was Leftship. It has the same errors. Two tiers of oars in an oarbox. No ventilation for Arnie and his cohorts. The prow is decorated with gold, apparently. On a minor warship ? The apotropaic eye is like a live thing from a fantasy film. Scale has gone to pot again. The oarbox on the Aula Isiaca ship has been reconstructed to be about 1 metre high. The warriors standing on the box here, which has only two oar levels, are diminutive. The men on deck seem to stand with the top of their heads circa 4,5m above the waterline. On a liburnian this should be about 3 m according to naval architects. Rightship appears to be directly based on a ship from the Temple of Isis, Pompeii. The caption states it is based upon the Aula Isiaca fresco - which does not show the prow of the ship - and is not shown here. The illustration on page 6 shows the prototype for Rightship. It is the author's own photograph. Confused ? Me too. Midship is the target of the others' attention and it surely deserves ours. It towers out of the water to the extent that the soldier's heads are about 7 metres above the sea. The deck must be at something like 5 metres. This is greater than the dimensions of a Six or even a Ten. According to calculations of naval architects published twenty years ago and not superceeded since. The gallery on the stern and the caption point to this being a liburnian but it has the rigging of a large freighter, with its very high mast, rope ladder and large sails. The timbers supporting the gallery seem to be about as thick as a human head and the steering oars are enormous. Midship is supposed to be based on a relief from the British Museum which shows a light bireme warship. The relief only shows the prow. The plate only shows the stern. The wales on Midship are not present on the relief, neither is the balustrade. The real stroke of genius is to inform us that ''On the prow of the British(sic) liburna ..are two parallel wales terminating forward in the proembelion, here not visible.' Read that again to make sure you get it. The artist is illustrating something not visible in the plate. The wales shown here cannot possibly terminate in the proembelion. These are not the wales you are looking for. On this composite you can see how the proembelion of the relief is mounted on a combination of the gunwhale and a wale originating between the oar levels. The wales on the stern of Midship do not correspond. At all. How goes the fight in Plate A ?. Not too well for the Tulip-Fanciers, it seems. Having chosen to clamber out onto the parados formed by the top of the oarbox. This is not clever. The oarbox top was sloped to deter boarders. Anyway, they perch there until plucked off by Roman javelins, a collision chucks them off or they just get bored and sit down for a while. What use could they fulfill standing there ? Why would they do that ? 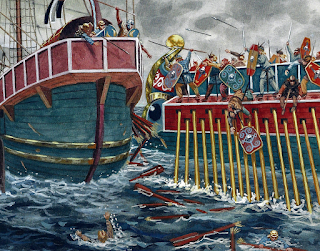 The Romans have a great time flinging javelins down from their eyrie, protected by the solid bulwark. Somehow, two men ended in the water. Where did they come from? The blue one must be a Roman - a crap fighter to get hit in this situation and a true athlete to chuck himself over the parapet afterwards. 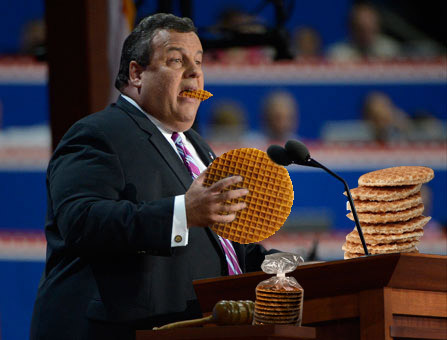 The blonde must be a stroopwaffel-eater judging by his clothing. He fell a looooong way. Oar fragments drift around. Try and work out from where and why they came. It seems that Rightship advanced from behind a faster ship and broke some of its oars with no danger to its own then ended standing-off to starboard of its target. Those Arnie-Orcs were doing over-time. Remember that we have two ships here which both have the same oar system. The target has the bonus of wind-power in what appears to be a stiff breeze, yet was struck. OK it's no big deal. The picture is off. However, reading the back cover one discovers that the book is 'Illustrated with meticulous new profile art, spectacular battles scenes...'. My arse. P.S. This book has the classic orphan footnote which refers to the authors' other work in the series. Shameless.